Psoriatic arthritis is a type of arthritis that can be seen in people with psoriasis. Psoriasis is a chronic skin condition that can cause patches of inflamed, red or scaly skin. In most cases of psoriatic arthritis, psoriasis was present before the arthritis. However in a minority of people, arthritis occurs at the same time or even before the skin rash appears. The exact cause of psoriatic arthritis is unknown. Genetic, immunologic and environmental factors seem to play a role in its development. Psoriatic arthritis is an inflammatory type of arthritis. This means there is not only pain but also swelling and stiffness in the joint. Pain and stiffness are usually worse in the morning and improve throughout the day or with activity. It is essentially the only inflammatory arthritis that can involve the distal part of the fingers also known as DIPs. The other type of arthritis that commonly affects these joints is osteoarthritis, which is not an inflammatory arthritis. It is one of the few types of inflammatory arthritis that can involve the spine (the other ones in this family, known as seronegative spondyloarthropathies, are ankylosing spondylitis, inflammatory bowel-disease associated arthritis, and reactive arthritis). Unlike rheumatoid arthritis, which is usually symmetrical, psoriatic arthritis can be asymmetric. For example, it can affect the left knee and the right wrist only. Psoriatic arthritis can sometimes cause swelling of an entire finger or toe, making a digit look like a sausage. This is known as “dactylitis” or “sausage digit”. Besides the joints, People with psoriatic arthritis can sometimes experience iritis, which is inflammation and redness in the eye. People with psoriatic arthritis may also be at higher risk of heart disease and stroke. Psoriatic arthritis is diagnosed by a combination of medical history, physical examination, labs and x-rays. A personal history of psoriasis makes it more likely that your inflammatory arthritis is in fact psoriatic arthritis. Features of inflammatory arthritis may include pain that is worse in the morning, stiffness in the morning lasting more than 30 minutes, and improvement of pain and stiffness with activity. Presence of psoriasis, swelling in joints, joint tenderness in the distal part of fingers or toes, inflammation of the entire finger or toe, an asymmetric involvement of joints can be suggestive of psoriatic arthritis. There currently is no specific blood test to diagnose psoriatic arthritis. People with psoriatic arthritis usually have a negative rheumatoid factor and CCP antibody (both seen in rheumatoid arthritis). A small percentage may have a positive ANA, a nonspecific antibody which can be seen in a variety of diseases including lupus. Some people with psoriatic arthritis who also have involvement of their spine may have a positive HLA-B27. There are specific features that may clue a radiologist or rheumatologist to the presence of psoriatic arthritis. 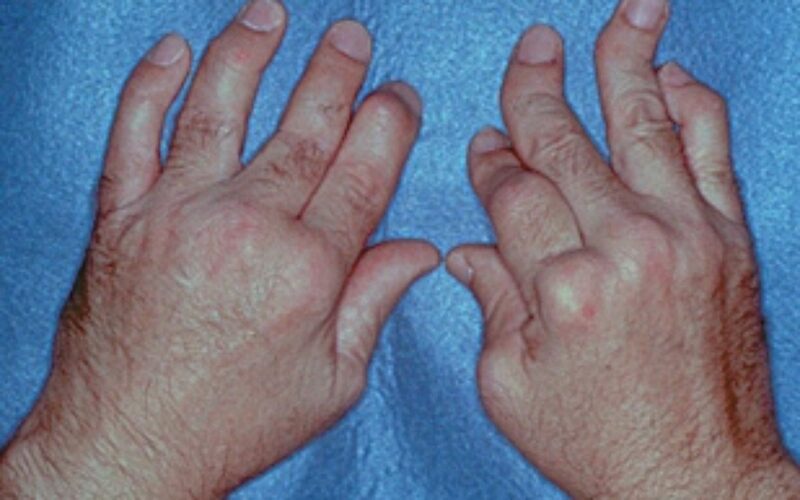 For example, the type of deformity that can be caused by psoriatic arthritis looks different from that of rheumatoid arthritis or osteoarthritis. Like all inflammatory arthritides, early treatment of psoriatic arthritis is associated with a greater chance of joint preservation and disease remission. Treatment is usually selected based on severity of the disease, patient preference, and other medical conditions someone may have. Medications from each category may be used alone or in combination with a medication from another category to achieve maximum results if necessary. Nonsteroidal anti-inflammatory drugs (NSAIDs). In order for these drugs to be effective, it is usually recommended that they are taken regularly. Disease-modifying anti-rheumatic drugs (DMARDs). These oral medications decrease inflammation, reduce pain, and can prevent joint damage. Laboratory monitoring is required every 2-3 months. Biologic drugs – these medications target a specific component of the immune system thereby decreasing inflammation and pain. They are administered either intravenously or subcutaneously. Otezla (Apremilast) – This oral drug suppresses multiple molecules that cause inflammation.